You know those girls who seem to look effortless without really even trying? I'm definitely not one of those girls. I wish I could just roll out of bed, throw my hair up in a bun and go, but truth be told, looking effortless takes effort. Or maybe that's just the perfectionist in me. My friend Laurin on the other hand, she's definitely one of those effortless types. She always styles her hair in the most adorable messy buns, so I thought it was high time I ask her about her hair secrets. 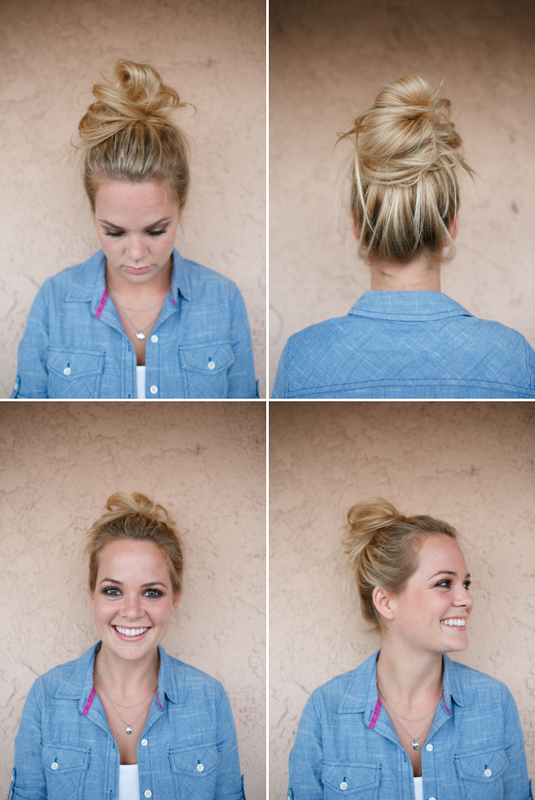 Here she shares with us how to create an adorable messy bun, shown here. 2. Gathering the bottom half of the ponytail as you go, twist elastic. 3. Pull elastic over to the other side of hair, creating a bun. 5. Loop elastic over the bun to the other side. This step can be repeated on the other side depending on how thick your hair is. Repeat until the elastic feels secure. 6. Mess up the bun to your liking and tuck any remaining strands of hair into the elastic or pin them with a bobby pin, depending on how you like it to look. 7. Optional: Give your messy bun a quick spray with your favorite hair/finishing spray and you're good to go! *This tutorial was done with freshly washed hair, but Laurin says that the dirtier, the better! Perfect for those days when you know it's time to wash your hair, but you don't have the time. Many thanks to Laurin for sharing her hair secrets with us! I wish there was video of this :( I'm having a hard time understanding. I think I have the same length of hair as her but I'm just not computing.